We actually saw the first of these images in September, featuring Sulley peeping out of a trapdoor as Buzz Lightyear, Princess Tiana and a host of other characters parachuted down in front of Sleeping Beauty Castle. This new set of images, provided for travel companies to use as their Summer 2010 brochure covers, follow the same template. Next up, another star from Toy Story Playland — Slinky Dog. Underneath him, Buzz peers out of a trapdoor in Main Street (you know, that trapdoor on Main Street), held up by Toy Soldiers, alongside four Little Green Men. In the background of this one, spot Emile from Ratatouille, Jessie with a suitably cow-themed parachute and, er, Nemo. In some of the images he’s been shown floating down in a kind of water bubble… not this time. You also have to wonder about the fate of racing car Lightning McQueen as he smashes to earth, but maybe we’re over-thinking the concept. Oh, well look at that! Lightning McQueen made it down safely! Here we also spot a couple of new poses — yes, the folks at Pixar were nice enough to send over several different stock images of their characters — so we see Woody holding his cowboy hat as he parachutes and Buzz folding his arms. All in a day’s work for a toy who can fly! One nice feature of the parachutes concept, at least, is that most of them are becoming “themed” to their respective character. So we see Emile with a cheese-patterned parachute, Woody with one to match his shirt, etc. In case you still don’t “get it”, it seems like the “Big Idea!” on the giant boardroom paper pad for 2010 is to show these “new” characters “parachuting” into the parks to visualise their arrival and new-ness. Got it? Plus, in these images, compared to the main New Generation Festival image (which will probably be the official Summer 2010 brochure cover) the characters floating down in the background have even actually been scaled and faded properly, so the image — however much still constructed like a series of stuck-on fridge magnets — does have a bit of depth. Finishing up, we’ve got Rémy and Emile from Ratatouille. There you go. Expect to see those on a travel company brochure near you in just a few months. Now, if you were sitting in the offices of one of those companies, which would you choose? Strangely, the RC version looks the most appealing from here. 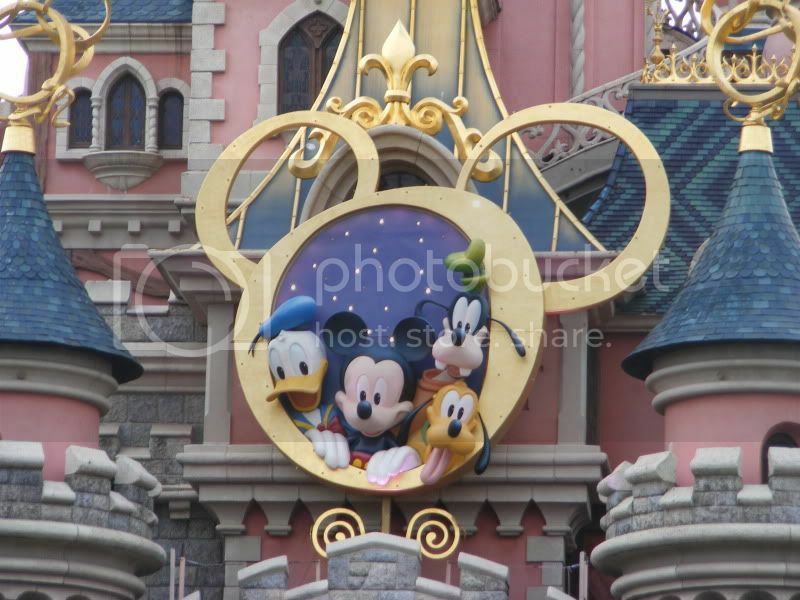 It’s worth repeating the slight moan from the article featuring the first of these images last month: what’s the need to mess with Sleeping Beauty Castle? Does sticking little Mickey silhouettes over its ornate stained-glass windows really achieve anything? If certain people had their way, would it not be a fantastical medieval palace but a monument to Mickey Mouse, with Mickey shapes on every spire and a hideous character decoration stuck on it’s fron… oh, wait. And here’s one extra criticism not from DLRP Today. Member MagicStar on magicforum was keen-eyed enough to notice the odd situation to the left of the Castle, where one of the famous square trees has been… squashed! Clearly, that pesky castle wall the Imagineers designed was getting in the way of the character clip-art, so it had to be shrunk down… taking the tree with it! Even more oddly, there’s a spot of branch — or something — still there on the right, sticking up into the air. Good to see important images like these are checked thoroughly. Even better — no, surely worse — something else has now cropped up on the left of these images, which isn’t there on the original one. Take a look just to the bottom-left of Tiana’s dress in the final image. Looks like the castle hill — almost — got the chop, but a dirty trail of Photoshop remnants was left behind. Disneyland Paris marketing, we know your secrets. A very disappointing and obviously lost opportunity to do something amazing here. I think they uploaded the images for the press with an ‘overscan’ on the image. If you look at the ‘Sully’ version (the ‘correct’ version), you will see that they zoomed the image so that those photoshop traces aren’t vissible anymore. Once printed on the brochures, those other posters will be displayed correctly, like the ‘Sully’ version.